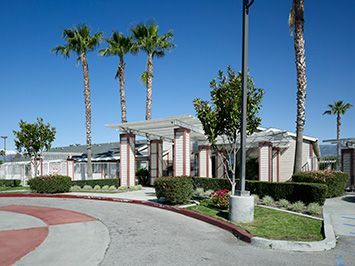 Base Line Co-op Apartments is a gated affordable senior housing community located in the city of San Bernardino, just south of the 210 and west of the 215 freeways. Situated on five acres are eight, one-story buildings and a community room with high cathedral-like ceilings and a community kitchen. Base Line Co-op Apartments does not allow smoking in any common areas, and within 25 feet of the building. Each spring residents can be seen planting their vegetable gardens and enjoying the wild flowers growing on the property. Residents gather on the patio to visit with each other and plan activities while enjoying the picturesque mountain views. This is a great place to live; you can be active and join committees and you have a say in how the building operates. Base Line Plaza was nationally recognized as “A Community of Quality” by the National Affordable Housing Management Association in 2011. Base Line Co-op is proud to be recognized as a NAHMA Communities of Quality Corporate Partner. This designation is for multifamily properties that have achieved a high standard of excellence in the way they are managed, the services they provide residents, the experience and training of personnel, and other criteria.